​Jury: Pharrell, Robin Thicke copied Marvin Gaye for "Blurred Lines"
LOS ANGELES -- A jury says singers Pharrell Williams and Robin Thicke copied a Marvin Gaye song to create "Blurred Lines" and awarded $7.4 million to Gaye's family. The eight-person panel reached the decision Tuesday after hearing nearly a week of testimony about similarities between "Blurred Lines" -- the biggest hit of 2013 -- and Gaye's 1977 hit "Got to Give It Up." Gaye's children -- Nona, Frankie and Marvin Gaye III -- sued the singers in 2013 and were present when the verdict was read. Nona Gaye wept as the verdict was being read and was hugged by her attorney, Richard Busch. Robin Thicke admits to being high while recording "Blurred Lines"
"Right now, I feel free," Nona Gaye said after the verdict. "Free from... Pharrell Williams and Robin Thicke's chains and what they tried to keep on us and the lies that were told." Thicke told jurors he didn't write "Blurred Lines" and wasn't present when it was written, despite receiving a songwriting credit. The pair recorded the song in one night; a segment by rapper T.I. was added later. Williams testified he crafted in the song in about an hour in mid-2012. He told jurors that while Gaye's music was part of the soundtrack of his youth, he didn't use any of it for "Blurred Lines." The Gayes' lawyer branded Williams and Thicke liars who went beyond trying to emulate the sound of Gaye's late-1970s music and copied "Got to Give It Up" outright. "They fought this fight despite every odd being against them," Busch said of the Gaye family outside court. The verdict may face years of appeals and could tarnish the legacy of Williams, a reliable hit-maker who has won seven Grammy Awards. He has become a household name -- known simply as Pharrell -- thanks to his hit song "Happy" and his work as a judge on the "The Voice." 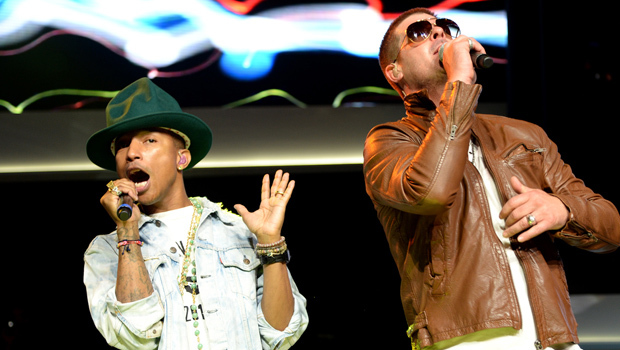 "Blurred Lines" has sold more than 7.3 million copies in the U.S. alone, according to Nielsen SoundScan figures. It earned a Grammy Awards nomination and netted Williams and Thicke more than $5 million each. During closing arguments, Busch accused Thicke and Williams of lying about how the song was created. He told jurors they could award Gaye's children millions of dollars if they determined the copyright to "Got to Give It Up" was infringed. Howard King, lead attorney for Williams and Thicke, told the panel that a verdict in favor of the Gaye family would have a chilling effect on musicians who were trying to recreate a genre or homage to another artist's sound. That version lacked many of the elements -- including Gaye's voice -- that helped make the song a hit in 1977. Busch derisively called the version used in court a "Frankenstein-like monster" that didn't accurately represent Gaye's work.